The interior of the 2017 London Aire. This is just one example of the many new floorplans in the 2017 Newmar line. RVers in the market for a new motor coach this year should expect to see a plethora of upgrades across Newmar’s series of Class A models that includes several new floorplans, interior design features, as well as an all-new 2017 King Aire at the top of its Luxury Coach Line. The company introduced the changes early April at its annual dealer meeting at the Gaylord Palms Resort in Orlando, FL. The 2017 King Aire, which features a full redesign as far as the front cab, starts with quality from the bottom up. The luxury coach now rides on what Newmar calls the Star Foundation (introduced in 2016), which is a solid steel structure welded on to the chassis to enhance body strength and stability, while another significant highlight is a new automotive-style driver’s console. 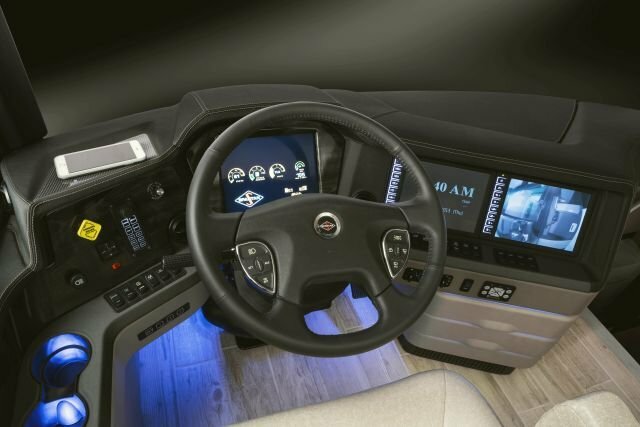 In addition to leather stitching in the finish and ambient LED lighting, drivers will appreciate its ergonomic design, which offers easy accessibility to the featured digital instrumentation, which replaces traditional analogue gauges (found on previous-generation Newmar dashes). The exterior of the 2017 King Aire. 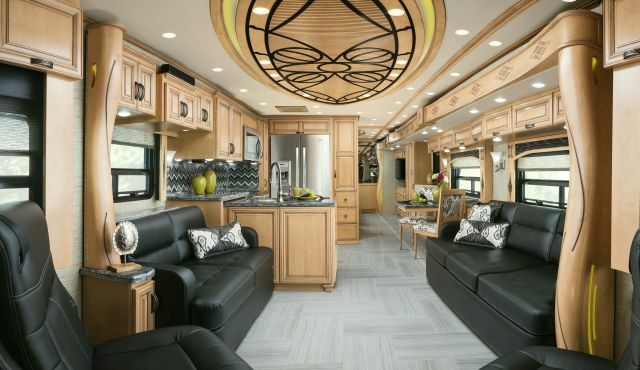 “Consumers will certainly take notice of the interior and exterior designs, as well as the new paint schemes,” says John Sammut, Director of Marketing for Newmar. 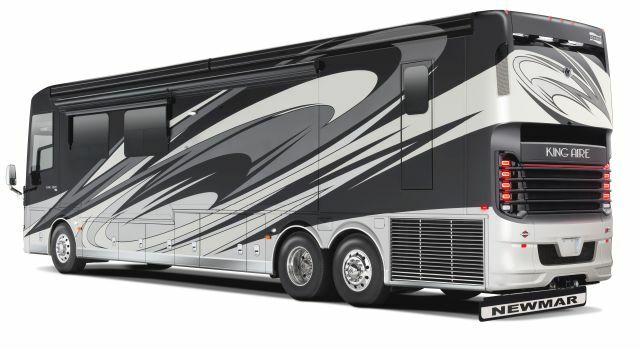 Another highlight for 2017 is the introduction of a two-bathroom floorplan, which is available for the London Aire and Mountain Aire in its Luxury Motor Coach Line, the Ventana, the Ventana LE and Dutch Star in its Diesel Motor Coach line, and the Canyon Star in its Gas Motor Coach line. The new digital dash design in the King Aire. “Over half of our floorplans are new for 2017, including a new bath model in five of our brands that features two full bathrooms with showers, which, to my knowledge has never been done in the motorhome segment. As some families travel with children, this is a very excellent idea,” added Sammut. The lineup also includes new slide out fascia designs on select models as well as fresh floor designs, featuring new tile shapes, tile sizes and laid inserts.